Tundra Swans spend the summer on the tundra of the Canadian Arctic and Alaska. 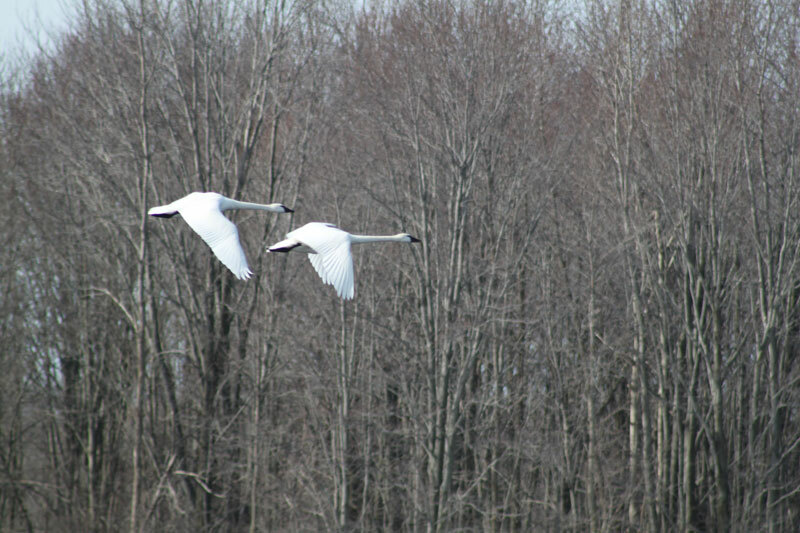 Each pair of Tundra Swans defends a large territory that may be more than 2 km2. 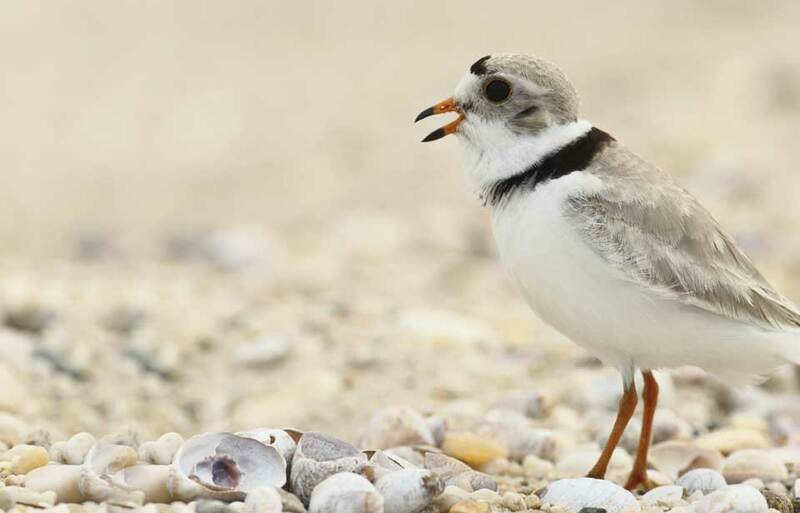 Even after they have returned to the wintering range, birds of the eastern population in the northern part of Chesapeake Bay may face a prolonged freeze in a severe winter. 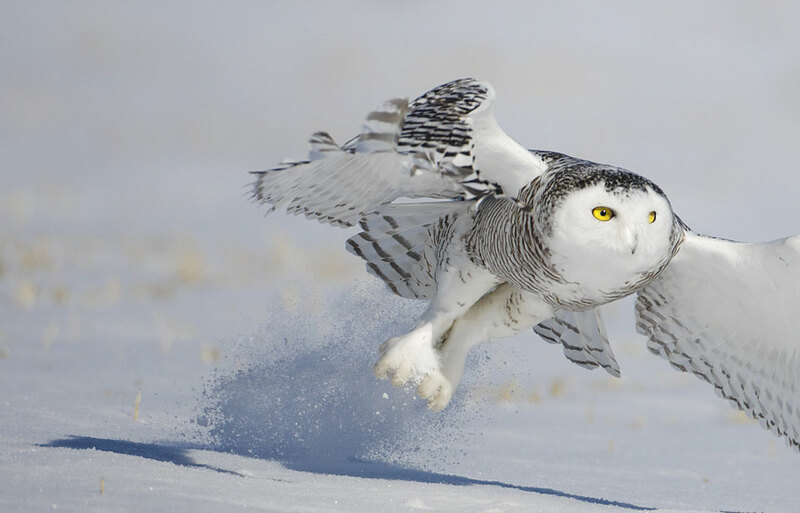 Rather than heading south to more temperate conditions, they sometimes spend most of this time sleeping on the ice, their heads drawn back under their wings. Often, many birds die, particularly young ones. 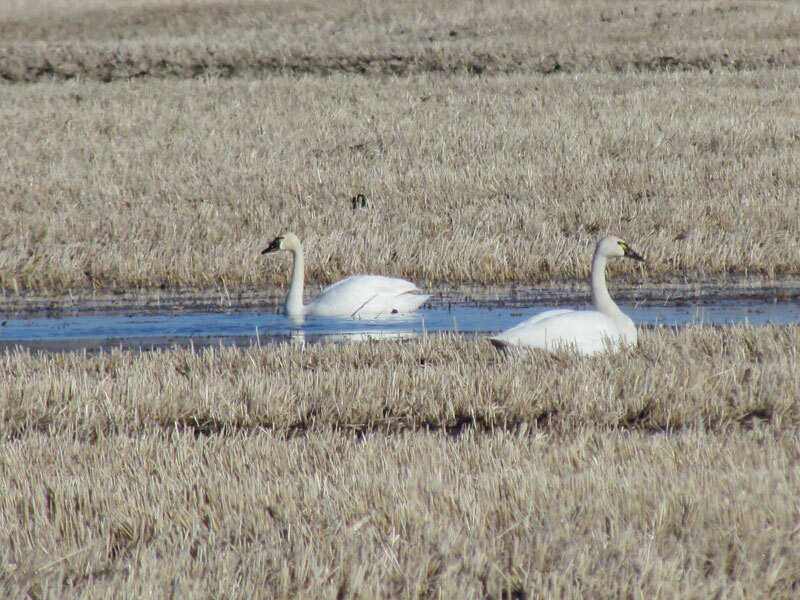 There are two populations of Tundra Swans—one in the east and one in the west. 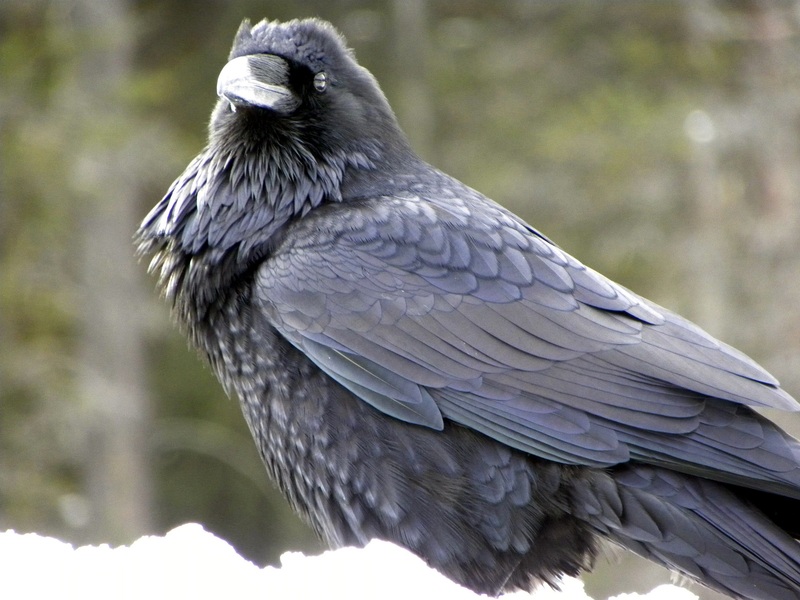 In summer the birds breed in northern North America, in the Canadian Arctic and in Alaska. 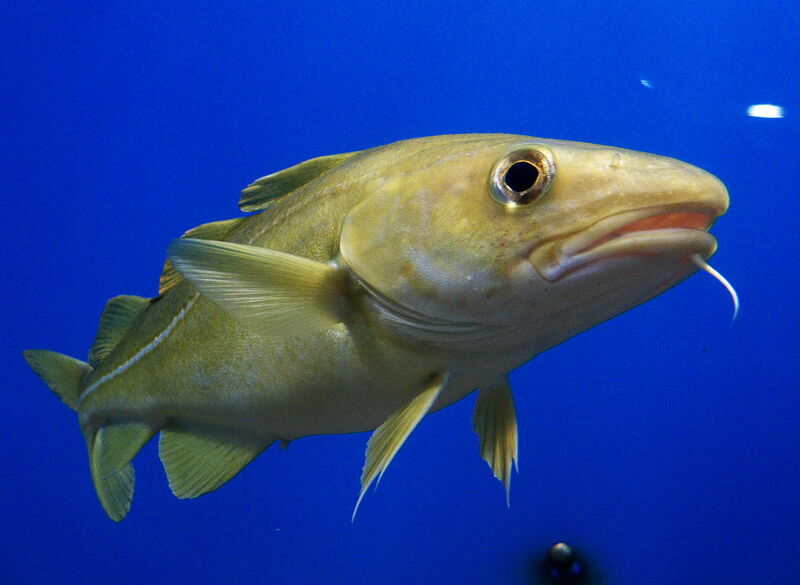 The eastern population winters on the Atlantic coast in Chesapeake Bay, in Maryland, and in North Carolina. 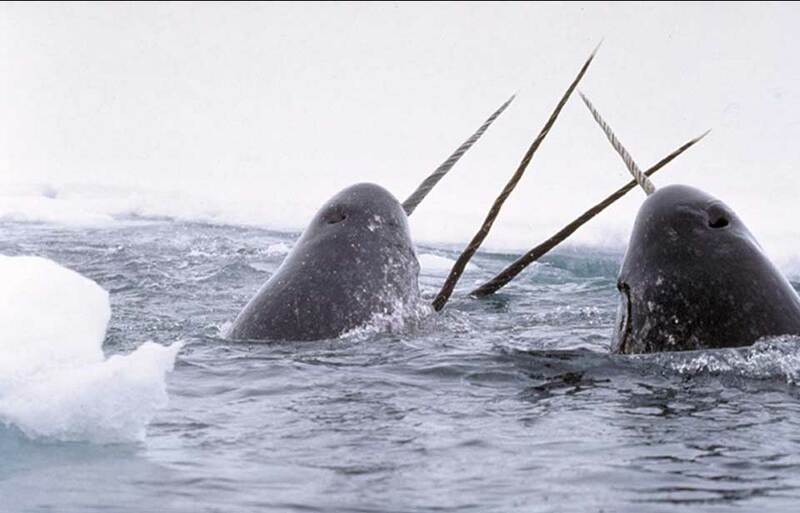 The western population breeds on the west coast of Alaska and winters on the Pacific Slope, mainly in California. 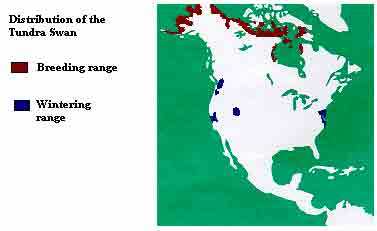 Twice a year, Tundra Swans migrate 6 000 km between these areas. Tundra Swans feed mainly on the tubers and roots of aquatic plants that grow at shallow depths in fresh, brackish, or salt water. They reach this food by extending the head and neck downward, frequently tipping the body but seldom completely submerging. On the Atlantic coast the swans vary their diet with molluscs, or hard-shelled water animals, such as mussels and clams. In recent years, they have begun to feed extensively on grains, such as corn and wheat that are left on the ground after the harvest. 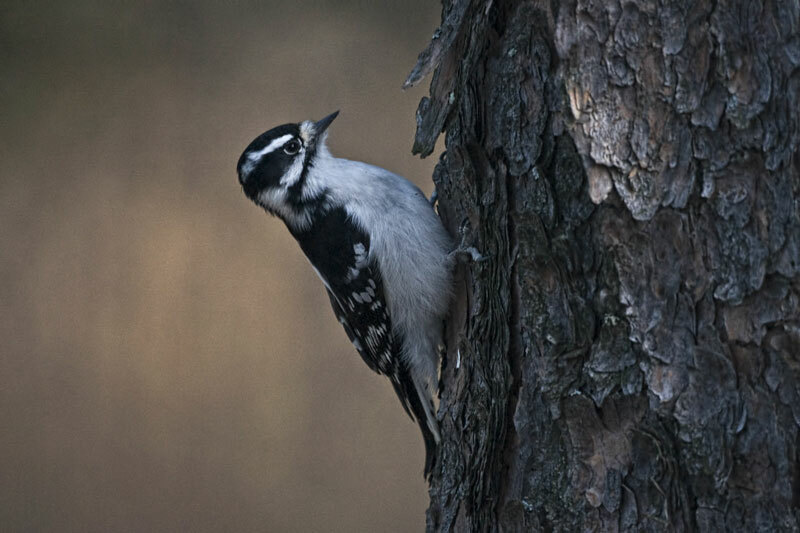 The courtship and pairing of young adult birds is in full swing in late winter and continues through the spring migration. 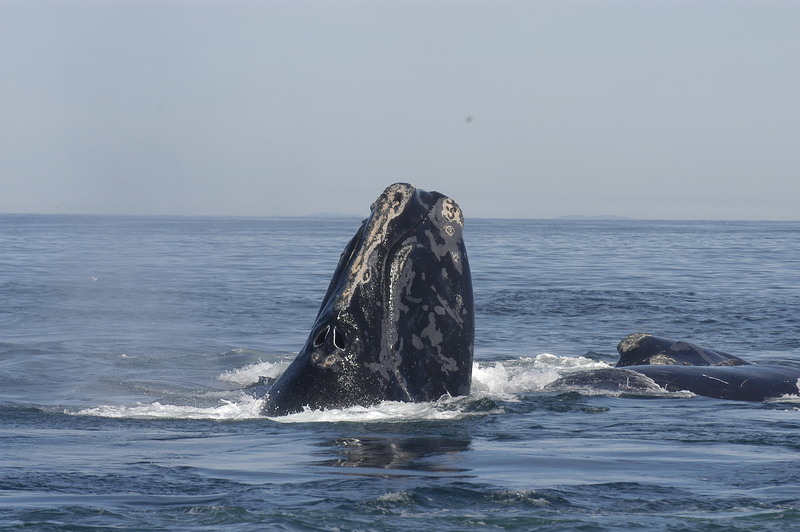 Adults already paired reinforce their bond by vocal and visual displays. The most spectacular of these is the so-called victory display in which male and female face each other, extend and wave the wings slowly, bow the head and neck forward and backward, and, in duet, produce a formalized sequence of loud, melodious sounds. The pair-bond is strong and probably lasts for life. Tundra Swans spend the summer on the tundra of the Canadian Arctic and Alaska. 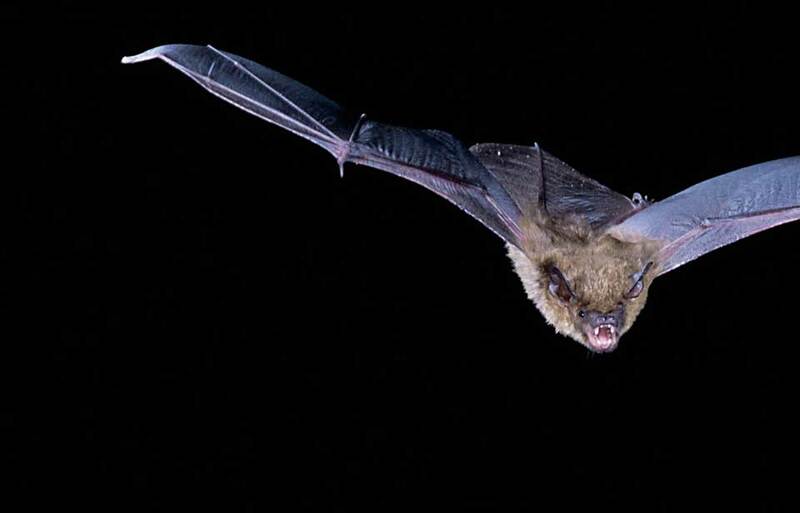 They are solitary nesters with each pair defending a large territory that may be more than 2 km2. The nest is a large conical affair of sticks, often placed on a hummock and lined with moss, sedges, and grasses. 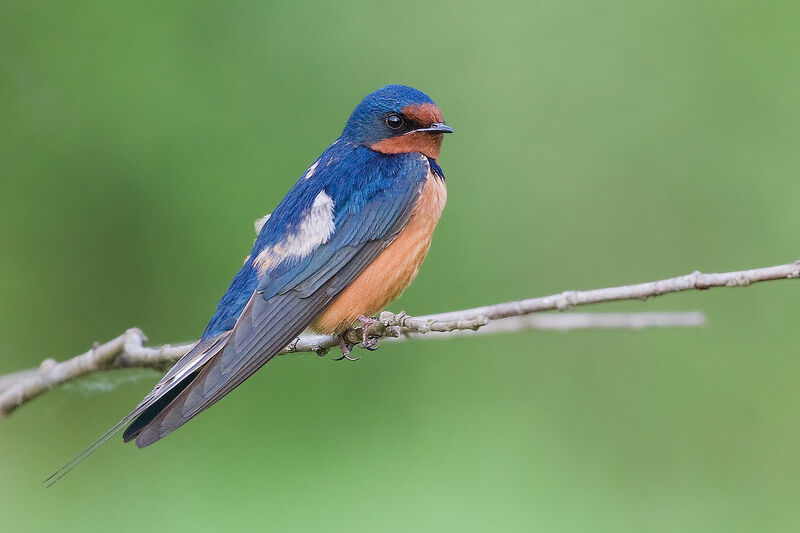 It is usually quite close to a tundra pond or lake that is large enough to provide a good feeding and loafing area for the young but not too large to defend against other breeding pairs. Nests in favourable locations tend to be re-used each year. Tundra Swans usually do not breed until their fourth or fifth year. 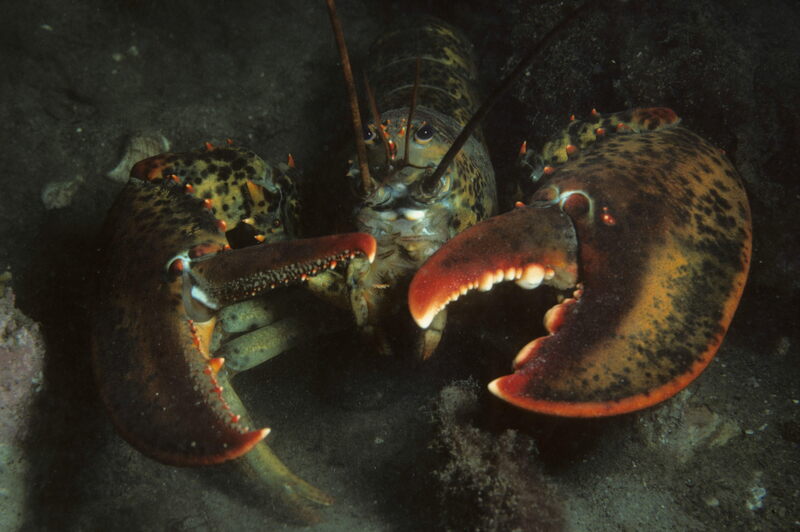 A year before breeding, pairs normally “go steady” and select and defend a territory without actually nesting. 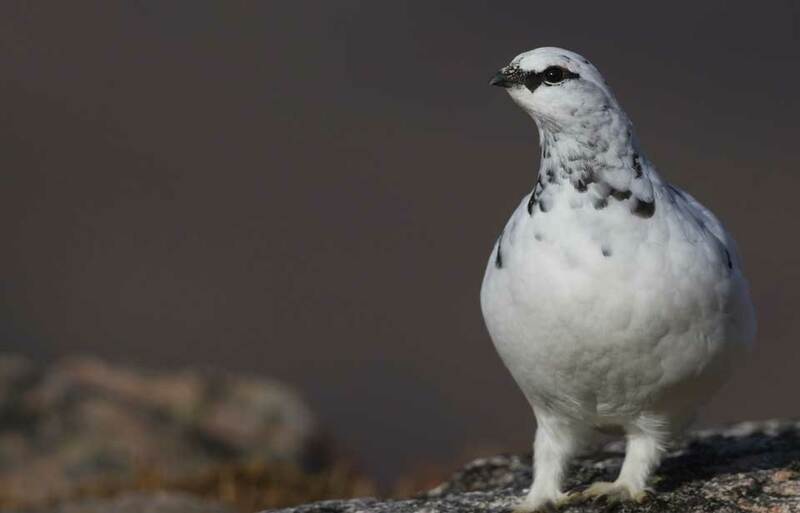 When they reach breeding age, they begin to nest in late May or early June before the snow is off the tundra, while many of the lakes are still frozen. The cream-coloured, elliptical-ovate eggs average 107 mm in length. A clutch of four eggs is normal; in exceptionally warm, favourable springs the female often lays five or six eggs. 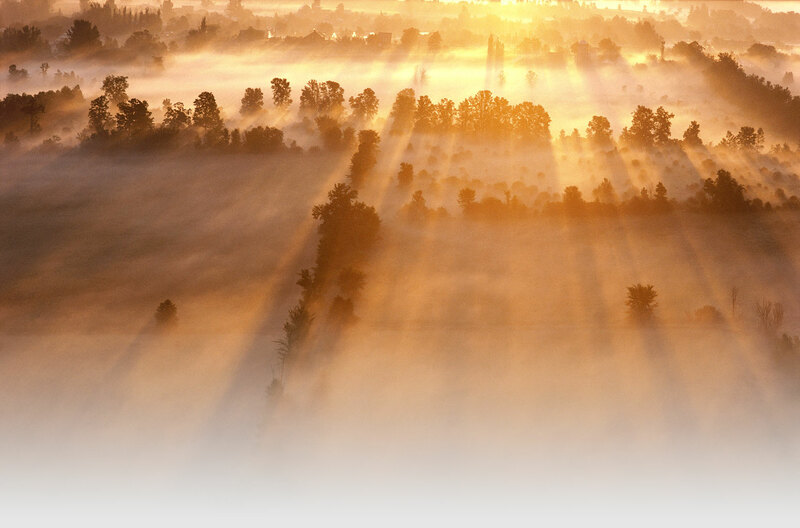 An unusually cold and snowbound spring, on the other hand, may inhibit nesting for that year. Not all adult pairs nest every year. 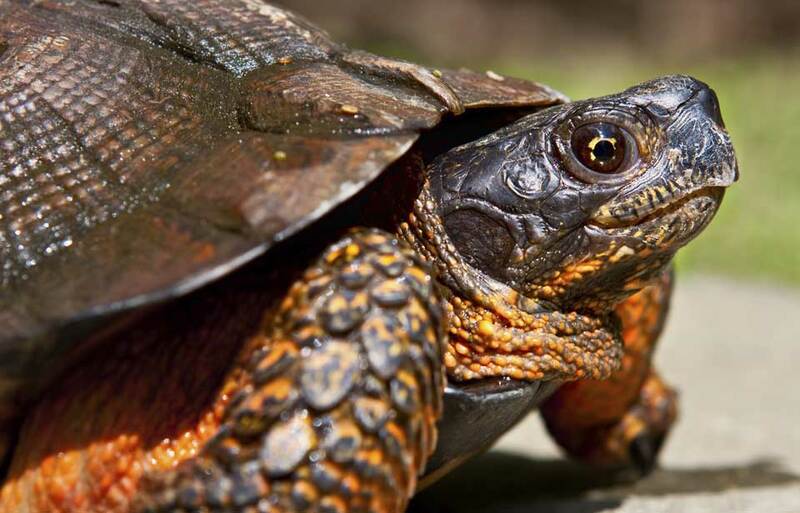 Incubation, or warming of the eggs until they hatch, begins when the final egg is laid and lasts about 32 days. 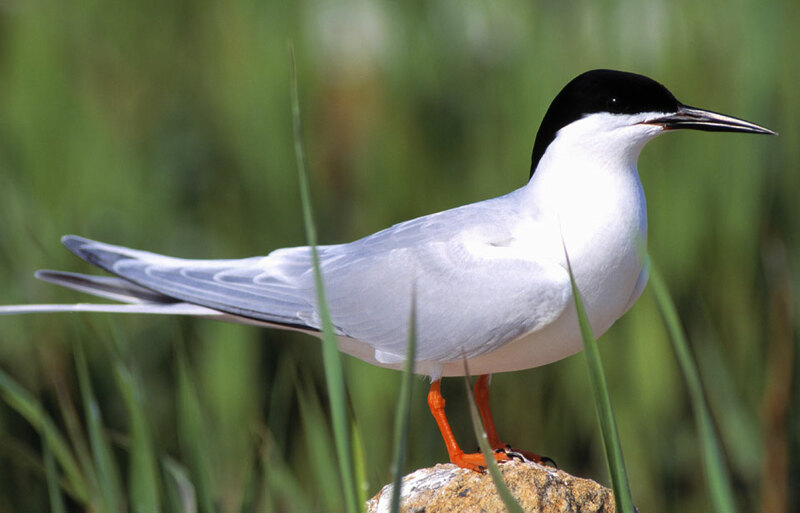 Only the female incubates the eggs, but the male remains close by, guarding the nest site and defending the territory. If the eggs are destroyed, renesting will not take place. The downy ash-grey cygnets emerge in early July and weigh about 180 g. They are soon able to hunt for their own food; both parents help them find suitable plant food around the margins of the pond. They need to be brooded, or kept warm by a parent sitting on them, frequently, to protect them from the cold and the onslaughts of numerous mosquitos. The early casualty rate among cygnets is quite high, chiefly due to cold or starvation. 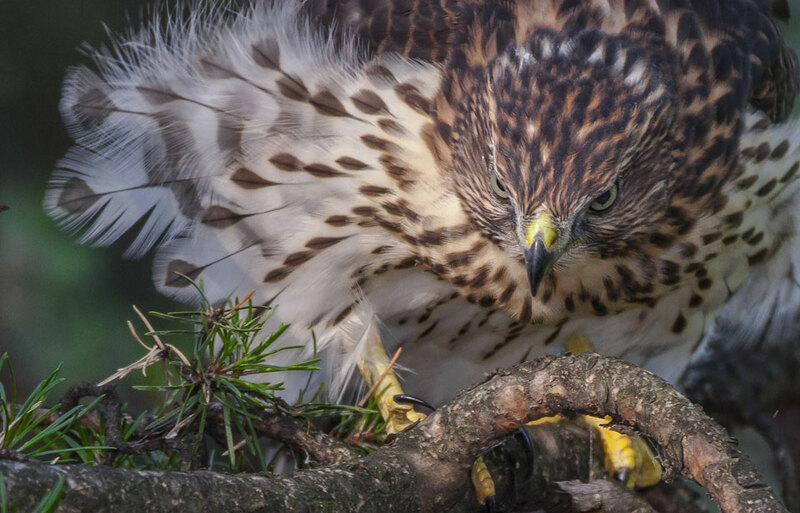 The family remains on the territory during August, when the adults undergo a moult period, or shed feathers. 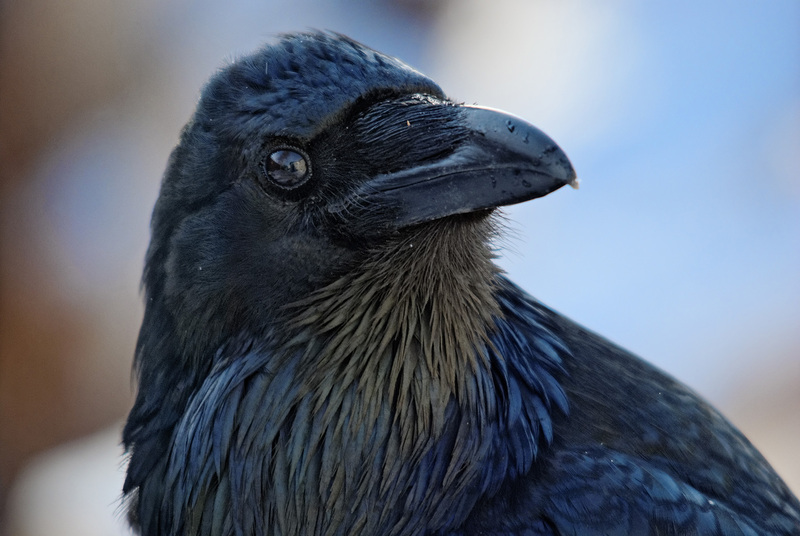 They are flightless for several weeks, until new primary wing feathers replace those that have been shed. If all goes well, the cygnets’ growth rate is very rapid and in September, after about 70 days, their weight may be 28 times the hatching weight. This growth rate is necessary, because by early September the cygnets must be fully feathered and able to fly well enough to travel to larger lakes that will freeze over more slowly. 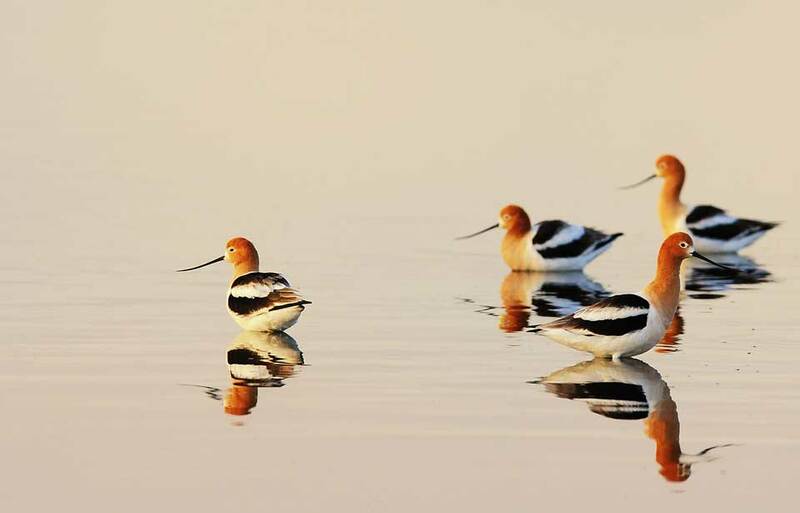 At these lakes they encounter young, non-breeding birds of the previous year and unsuccessful nesters or unpaired adults that have spent the summer in small groups in favourable feeding locations. 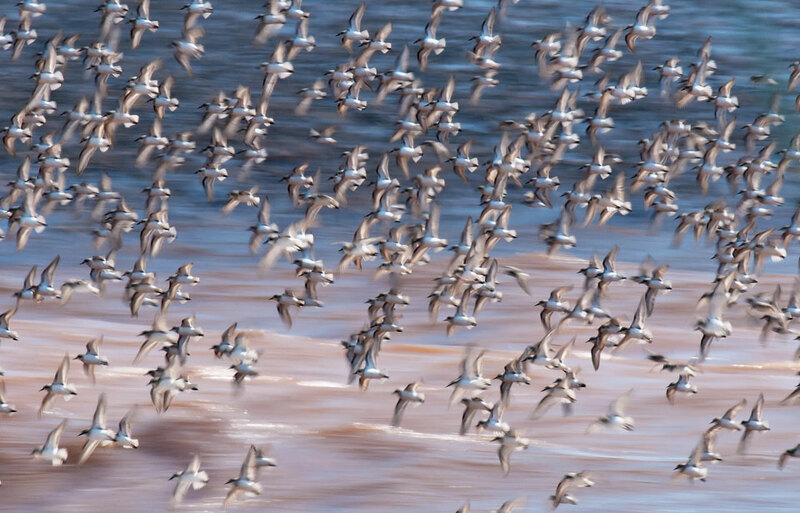 From these points, the flocks begin the early stages of migration as freeze-up approaches. An early winter will doom cygnets not yet ready to fly out of the north. Tundra Swans have few natural enemies other than humans. Golden Eagles, jaegers, wolves, foxes, and bears no doubt take some toll of eggs and young on the tundra, but their influence on the swan population as a whole is very small. An aroused adult Tundra Swan is quite a formidable opponent, and a pair can usually fend off most predators. 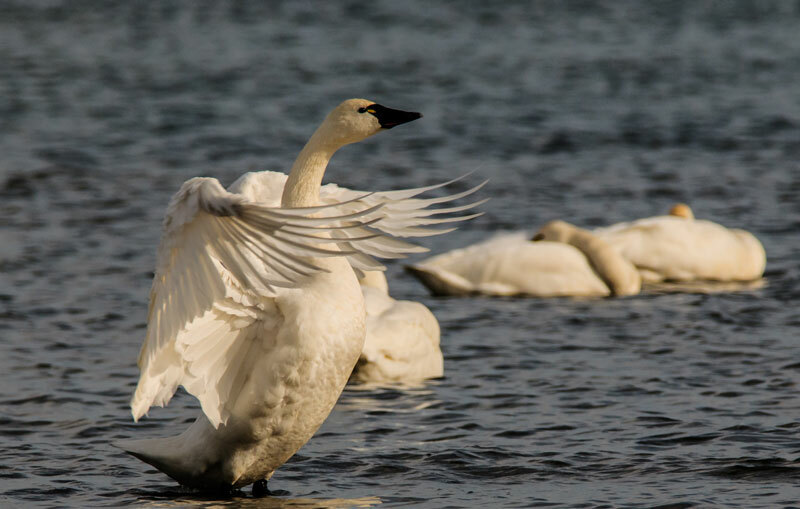 During migration and on the wintering grounds, the Tundra Swan has been protected traditionally by bans on hunting. 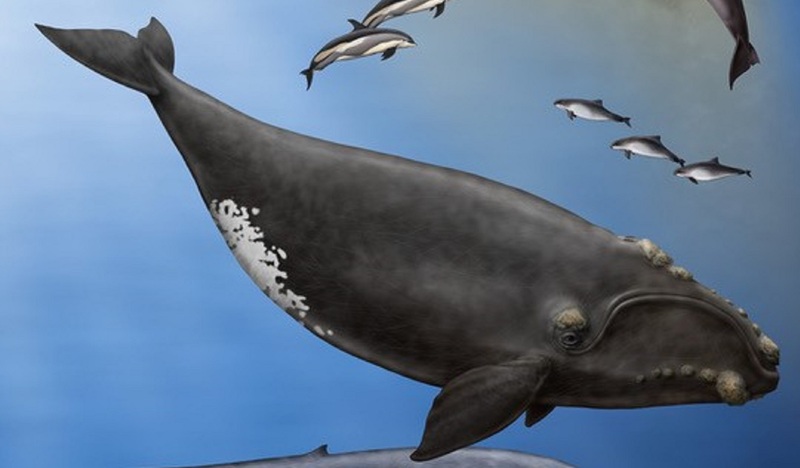 This is partly because there is broad public sentiment for protection of such aesthetically pleasing creatures. There is now a limited open season in some western states, however, with pressure to extend the season to other areas. 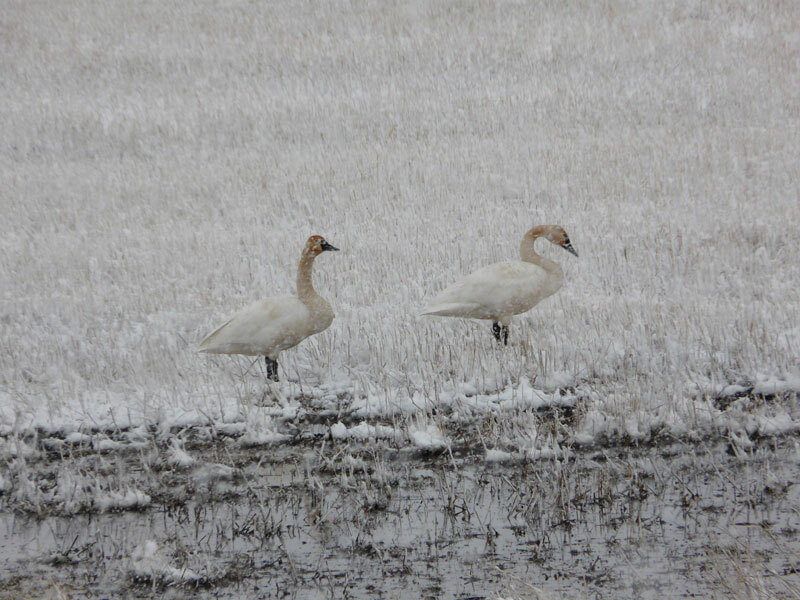 The principal factor limiting Tundra Swan populations is the adverse weather the swans often face on all parts of their range, but particularly on the breeding grounds. A late spring may prevent nesting; an early freeze-up may cause heavy casualties among the young. 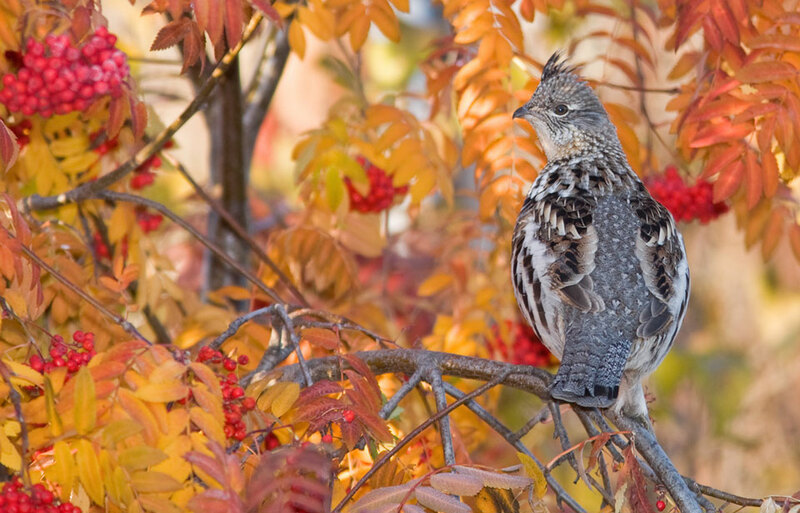 Consequently, the size of wintering populations may swing widely, with the number of young birds varying from less than 10 percent to more than 30 percent of the total. 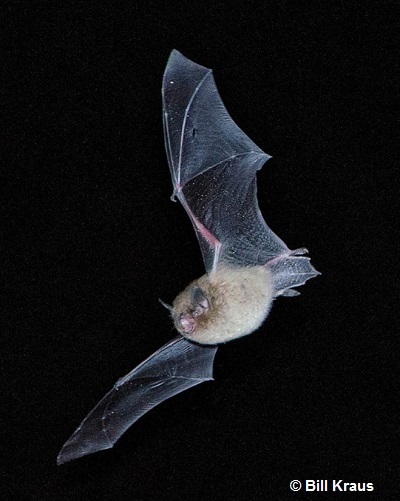 The western population is exposed to a somewhat less severe climate in both the breeding and wintering ranges; this may explain why, although the range of the western group is smaller, the two populations are roughly the same size. 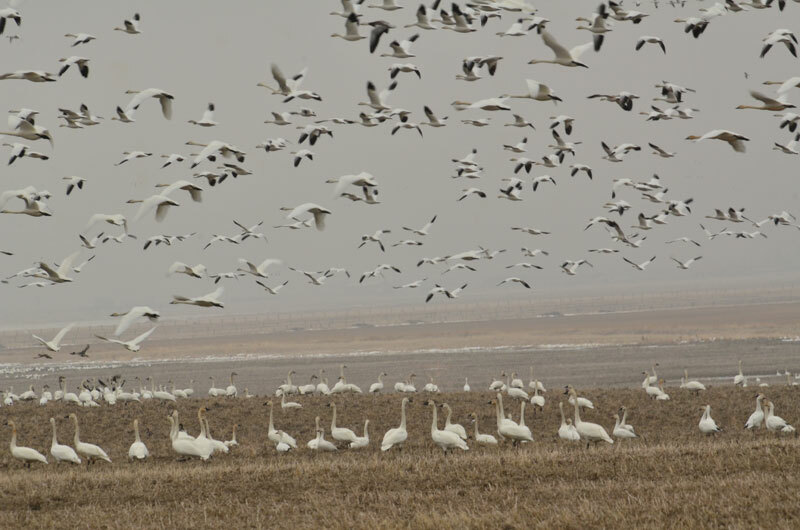 Another factor now threatens the future of the Tundra Swan. 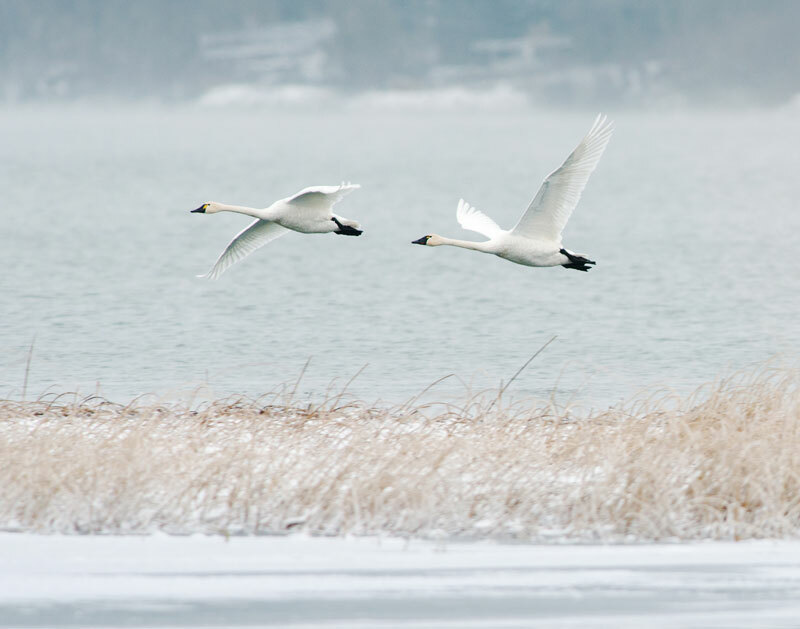 Swan migration and winter habitats are being altered by human activity. 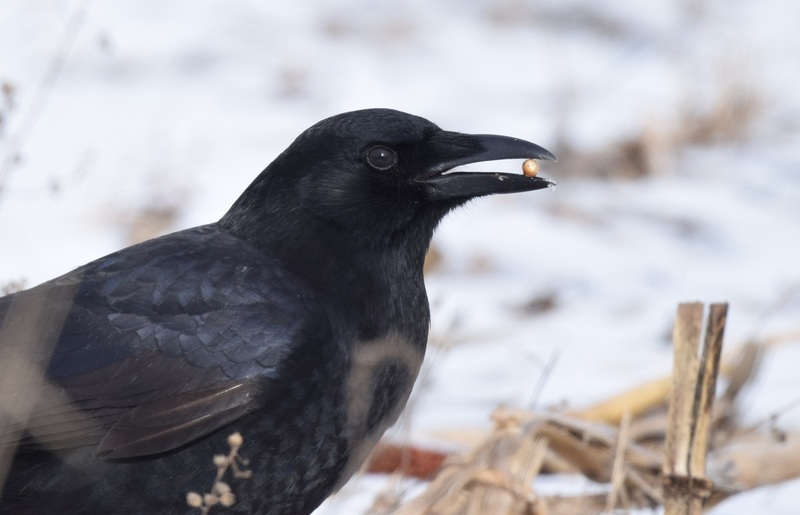 Water pollution in Chesapeake Bay and the lower Great Lakes and water diversion east of the Rockies may reduce food supplies on the wintering grounds. Drainage of sloughs on the prairies and changing water levels and flow rates due to dam construction and water diversion endanger all the major staging areas. 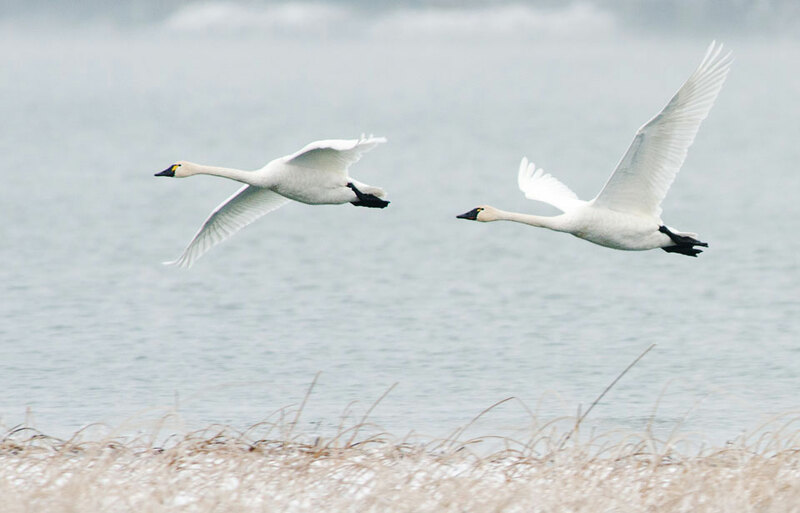 The change in the feeding habits of Tundra Swans poses an important question. 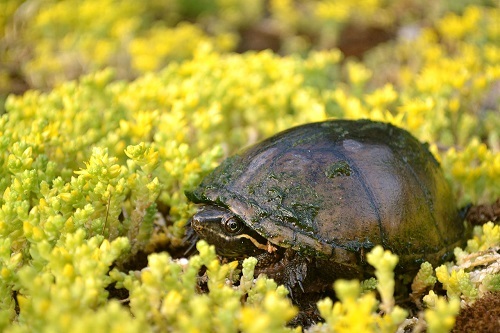 Are the birds switching from aquatic plants to field grains because they prefer this newly discovered food source, or is the destruction and pollution of many marsh areas forcing them to find other food sources? In either case, their increasing dependence on agricultural crops leaves them vulnerable to sudden changes in crop production. Tundra Swans are rugged, long-lived, durable birds accustomed to adversity. 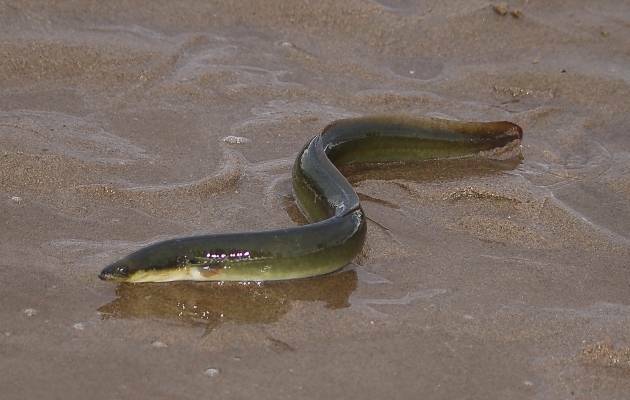 However, they tread an ecological tightrope; the advantages provided by isolated breeding grounds are offset by a long migration route and a short breeding season. Human developmental activities now extend throughout the swan’s range and may very well determine the fate of this magnificent bird. Bellrose, F.C. 1981. Ducks, geese, and swans of North America. Revised edition. Stackpole Books, Harrisburg, Pennsylvania. Gunn, W.W.H. 1973. Environmental stress on the whistling swan. Wildfowl 21:5–7. Johnsgard, P.A. 1975. 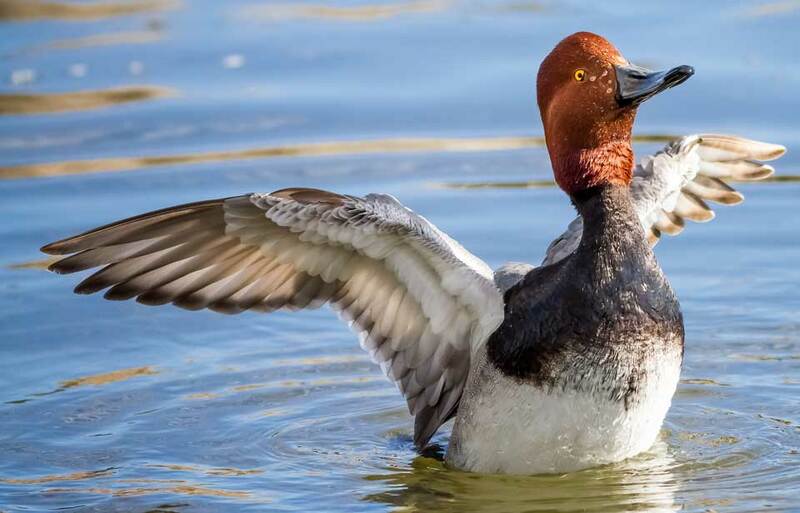 Waterfowl of North America. Indiana University Press. Palmer, R.S., editor. 1976. Handbook of North American Birds. Volume 2, Waterfowl (first part). Yale University Press, New Haven, Connecticut. Scott, Sir Peter. 1972. The swans. Michael Joseph, London. Sladen, W.J.L. 1973. A continental study of whistling swans using neck collars. Wildfowl 21:8–14. © Her Majesty the Queen in Right of Canada, represented by the Minister of the Environment, 1979, 1998. All rights reserved.